I absolutely love our townhouse and the area we live in. We are in walking distance to many shopping centers and some of our favorite stores/restaurants. Bradley and I often walk to Panera for a quick lunch when we want to get out of the house and get some fresh air, and luckily it's right down the street. I'm a big fan of their "You Pick Two" option and my order always consists of Broccoli Cheddar Soup and some sort of sandwich. 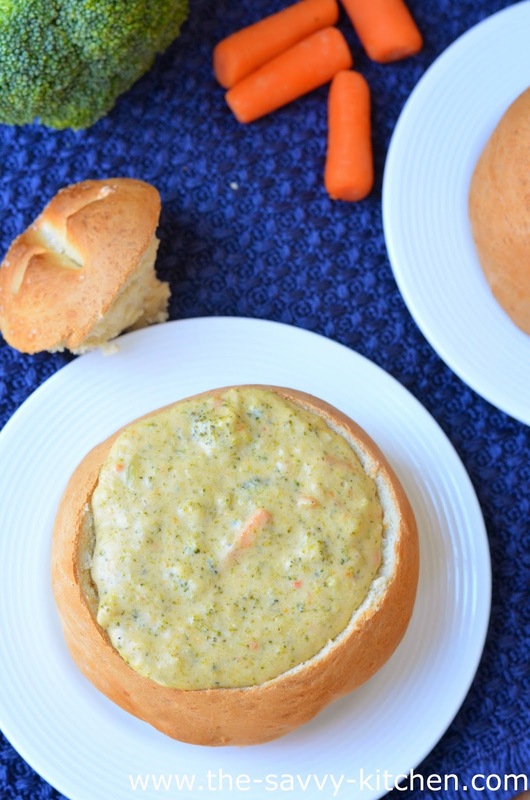 When my whole family was feeling under the weather, instead of running out to Panera for some soup I decided to make a copycat recipe of their soup at home. It tasted incredibly similar and I like how I was able to adjust the consistency on my own. I like it a little chunky, but I was able to blend some up a little more for Bradley. 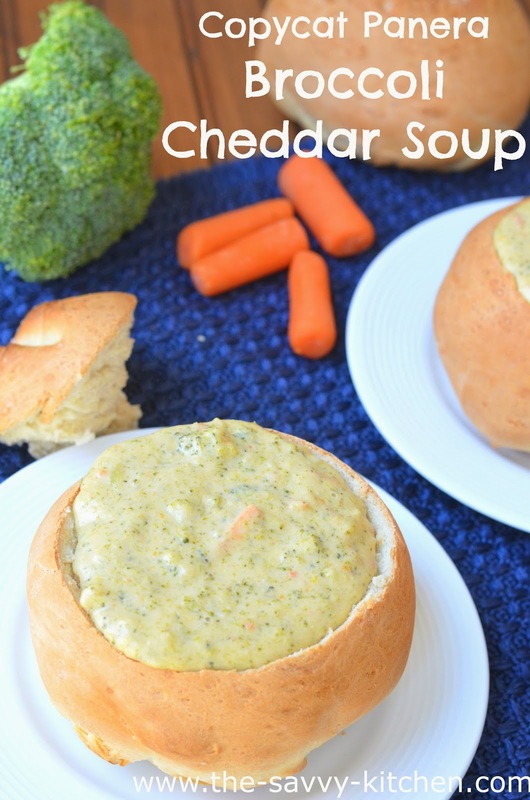 This cheesy, thick soup is easy to make and ideal on a chilly day. Enjoy! Break apart broccoli florets into small pieces. Heat a dutch oven to medium heat. Melt 1 tablespoon butter and add onion. Cook until transparent, about 5 minutes. Add remaining butter to dutch oven. Once melted, add flour and stir to make a roux. Continue cooking for 1 minute. Add in half and half, stirring constantly. Once smooth, pour in 2 cups chicken stock. Bring to a boil then lower heat and allow to simmer for 20 minutes. Add broccoli and carrots and simmer for an additional 25 minutes over low heat. If you want a smooth soup, at this point puree in a blender and return to heat or use immersion blender. Add cheese and nutmeg to the dutch oven. Stir until cheese is melted. Add salt and pepper to taste. If you want a thinner soup, add remaining 1 cup chicken stock. 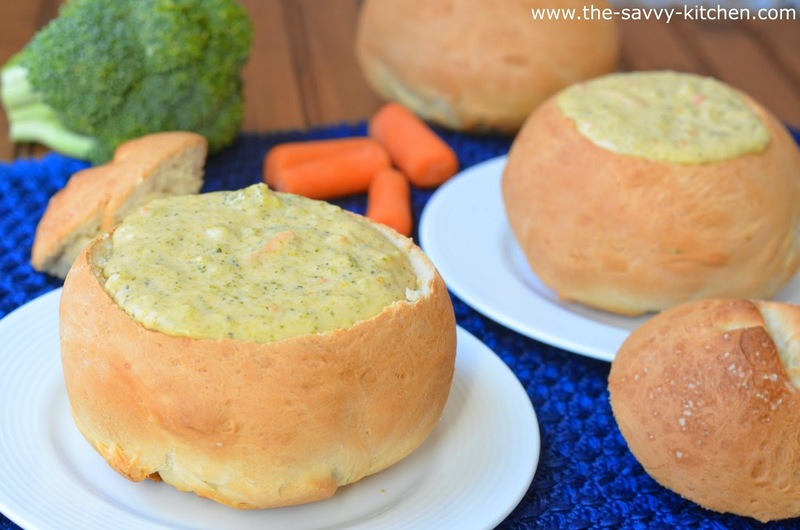 Stir to combine and serve immediately in bread bowls.